Last major update issued on May 10, 2005 at 03:40 UTC. The geomagnetic field was quiet to active on May 9. 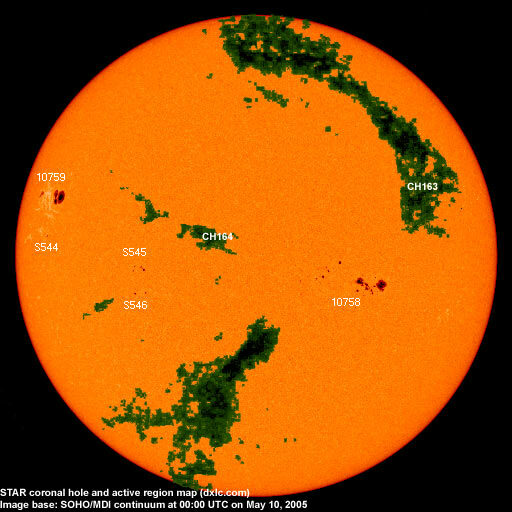 Solar wind speed ranged between 502 and 704 km/sec. During the latter half of the day the high speed stream from CH163 gradually replaced the recent CME as the main solar wind factor. Solar flux measured at 20h UTC on 2.8 GHz was 110.0. The planetary A index was 11 (STAR Ap - based on the mean of three hour interval ap indices: 11.4). Three hour interval K indices: 33111234 (planetary), 33122223 (Boulder). Region 10758 lost quite a few spots as the leading and intermediate spot sections became more compact and added penumbral area. There's a weak magnetic delta structure in the southeastern part of the largest intermediate penumbra. An M class flare is possible. Flares: C2.8 at 03:37, C1.4 at 10:08, C8.9 at 11:03, C5.6 at 11:46, C2.5 at 12:31 and C1.8 at 12:43 UTC. Region 10759 changed with the leading penumbra splitting off two penumbrae, one in the southeast and the other in the northeast. In a rather unusual magnetic field configuration a narrow strip of negative polarity is separating the three positive polarity penumbrae. M flares are possible. Flares: C3.7 at 21:09, C2.7 at 23:05 and C2.7 at 23:35 UTC. [S544] This region rotated into view at the northeast limb on May 8. Location at midnight: N03E60. [S545] A new region emerged in the southeast quadrant on May 9. Location at midnight: S06E28. [S546] A new region emerged in the southeast quadrant on May 9 just south of region S545. Location at midnight: S12E28. 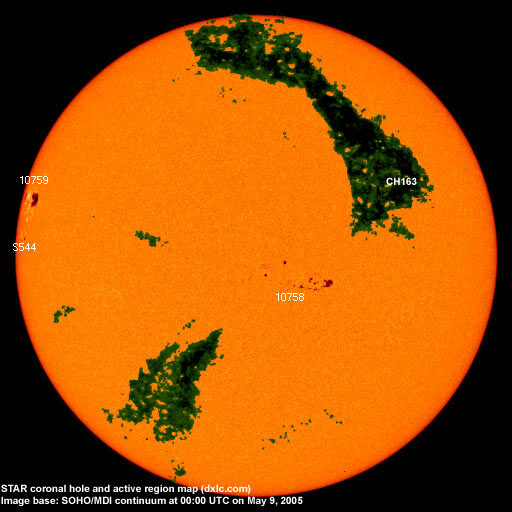 May 7-9: No obviously fully or partly potentially geoeffective CMEs were observed. 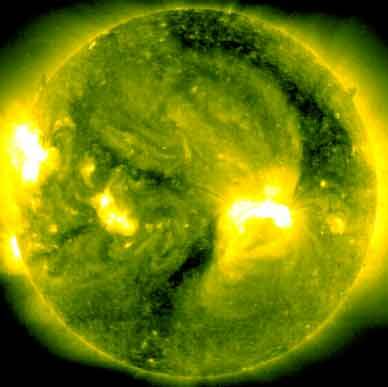 A large recurrent coronal hole (CH163) in the northern hemisphere was in an Earth facing position on May 6-7. A small coronal hole in the northern hemisphere near the equator will be in an Earth facing position on May 10-11. Processed SOHO/EIT 284 image at 01:06 UTC on May 10. The darkest areas on the solar disk are likely coronal holes. The geomagnetic field is expected be quiet to active on May 10 due to a high speed stream from CH163 and quiet to unsettled on May 11-12. Quiet to active is possible on May 13-14 due to a low speed stream from CH164. Long distance low and medium frequency (below 2 MHz) propagation along east-west paths over high and upper middle latitudes is poor. Propagation along long distance north-south paths is poor. Trans Atlantic propagation conditions are normally monitored every night on 1470 kHz. Dominant stations tonight: Radio Cristal del Uruguay and CPN Radio (Perú). Rádio Cristal (Brazil) on 1350 kHz had the best signal of the observed trans Atlantic stations. From North America both WWZN on 1510 and WWRU on 1660 were audible. SEC active region data for May 9 was unavailable at the time of this report.